I kept thinking about the bike toll issue and came up with this cartoon. 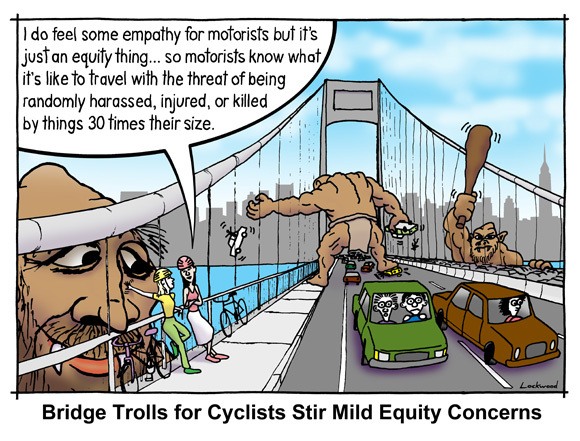 It’s strange how motorists care about equity when it comes to paying a bridge toll but when it comes to inequity for randomly killing and maiming cyclists, they are indifferent at best. What would happen if one were to achieve equity for the latter? Would anyone be concerned then? Would indifference prevail? Would cyclists be concerned that the field has been leveled? Someone did the math on this somewhere that I saw. Basically, the relationship between weight and road wear (or structure wear in this case) is not linear, so even this comic isnt telling the whole story of how little bikes should pay compared to cars. @BBnet3000:disqus Actually that someone was me. Road wear is roughly proportional to weight to the fourth power. So if the 6525 pound SUV was charged $65.25, the 150 pound cyclist would only be paying 0.0018 cent. Or conversely, if the cyclist was charged $1.50, then the SUV would be paying $5.37 million. Road wear of course doesn’t tell the entire story here. Even bike/pedestrian paths don’t stay in good repair forever. The actual relationship between true maintenance costs versus weight is somewhat complex, but proportionality to weight squared might be a good approximation. Under that scenario, the SUV would be paying about 2000 times what the cyclist does. Any way you look at it, if you arrive at a fairly reasonable toll which motorists will stomach (say $20 or less), cyclists come out paying one cent or less, an amount not even worth collecting. And, regarding a hypothetical carbon tax, walking should probably be considered the baseline with a zero tax; and since cycling is three times more efficient than walking, they should incur a tax one-third that of walking; and, cars should rapidly be phased out since they are very successfully destroying civilization as we know it and with current costs in the $trillions will effectively cost many times more as climate change rapidly accelerates. Bring on the huge trolls! Equity Equity Equity! I don’t understand why road wear would be the relevant metric for deciding how much to charge for a vehicle toll. Tolls usually are imposed as a revenue source that can be bonded to pay for the construction of the bridge or road. Tolls collected beyond this level are seldom dedicated to maintenance of a specific piece of infrastructure. A system where every bridge had to pay for itself via toll revenue would be equivalent to forcing the MTA to operate and maintain the subways and buses using only fare revenue. Although there are practical reasons why collecting tolls from bicyclists may not be feasible, morally bikes should pay to the extent that there is bike infrastructure. @J_12:disqus That’s a pretty shaky conclusion… the cost for cycling-only infrastructure is vastly less, so it makes sense that car drivers should pay more for something that is only so very expensive because it caters to their needs. Miles Bader, most bridges with bike lanes have physically separated facilities, which, while cheaper than 6 lanes car roads, are not free. But perhaps more importantly, the bike infrastructure piggybacks on the existing bridge structure. It’s much cheaper to hang a bike lane from a bridge that already exists, but somebody needs to pay to build and maintain the whole thing. Take the case of a bridge built for bikes only. While it is not as expensive as a bridge built to carry cars, it is going to cost tens to hundreds of millions. If you believe in any kind of “user fee” based tolls, then surely you can’t morally oppose a toll on bikes for such a bridge. In the case of a bike lane on an existing, car carrying bridge, it is a bit more complicated. The tolls are really being collected for the benefit of a larger transportation system, not for that single piece of infrastructure. I think, if there were an easy and cost effective way to collect it, that a toll on bikes would be justified. Furthermore, I would propose it should be on the order of how much road space a bike uses, not on the order of how much damage it exerts on the road surface. Something around 1/10 of the car toll sounds about right to me. > If you believe in any kind of “user fee” based tolls, then surely you can’t morally oppose a toll on bikes for such a bridge. Or by this reasoning, a toll on walking across a bridge. Or for admiring it from afar. But that’s not how anyone, anywhere reasons about user fees. We charge for some government services and not others (use of the sidewalk, public waste bins, calling 911) based on many factors, not some universal tolling morality. Some uses are impractical to toll, and some uses should be encouraged for the greater public good. Some uses are so expensive they are bankrupting the government. And where morality does factor in, we may consider that some uses are literally killing us. External factors must come into play when we decide what to toll and how much. And so, around the world, there are many tolls for automobiles crossing bridges and tunnels and very few for pedestrians and cyclists. Few people find this unusual, much less immoral. Maybe the cartoons exaggerate to make a point, as cartoons will do; weight and wear and tear do not fully describe the economics of using a bridge. 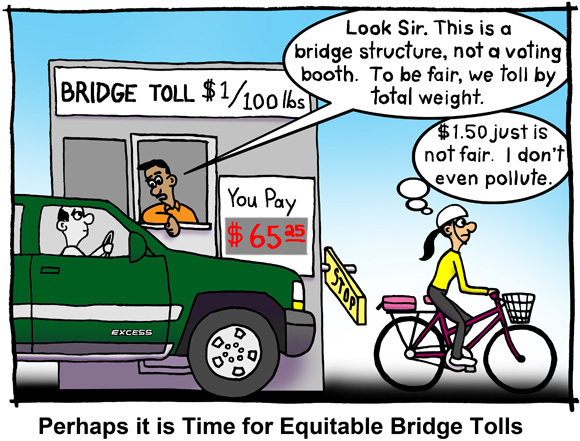 The toons are a reaction to the spurious argument that it’s only fair and equal to charge a toll to everyone using a bridge if it’s charged to those operating personal multiton vehicles. That’s not the case, and if we must watch some of the more extravagant and fragile elements of motordom collapse before motorists are willing to contribute more to their upkeep, we can do that. The 20th century has left American pedestrians and cyclists with very little to lose, and plenty of patience. Would you pay a Half Dollar to Bike Across the GWB?